Senepol cattle were developed on the Caribbean Island of St. Croix by Henry C. Nelthropp in the early 1900's by crossing Red Poll and N'Dama cattle. 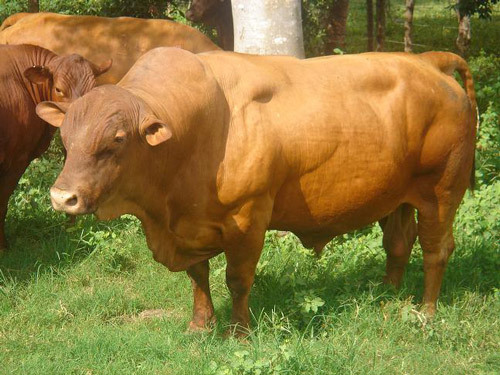 They combine the N'Dama characteristics of heat tolerance and insect resistance with the extreme gentleness, good meat, and high milk production of Red Poll cattle. They are selected for early maturity and maternal efficiency, no horns and solid red color, definite heat tolerance, and gentle disposition. Since they were isolated on the island they were sheltered from the fads and fancies of the purebred seedstock industry. While other breeds made giant leaps in one direction, only to turn and make equally large strides in the opposite direction, the Senepol made a series of small, multiple-trait steps toward animals whose production met the demand of their breeders.